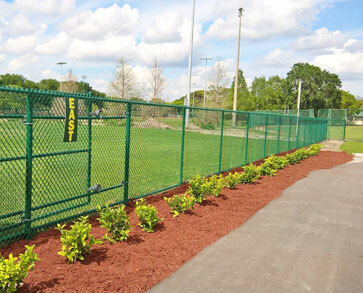 Orlando Chain Link Fence Installation | All County Fence Contractors LLC. Chain link fence from All County Fence Contractors consists of of heavy steel wire woven to form a diamond-shaped mesh. Chain link fence can also be referred to as, cyclone fence, hurricane fence, or diamond-mesh fence, and is a type of woven fence usually made from galvanized -coated steel wire. The wires run vertically and are bent into a zig-zag pattern so that each “zig” hooks with the wire immediately on one side and each “zag” with the wire immediately on the other. This forms the characteristic diamond pattern. Chain-link fences are everywhere. So, why does this fencing type remain one of the most popular options year after year? A chain link fencing project is the perfect solution for homeowners looking to establish a strong, secure property line. Residential Chain-Link fencing is low-maintenance, highly durable, weather-resistant, and can last for nearly a lifetime. Plus, it’s affordable, both in up-front costs and in the long run, making it a wise investment. Options for chain link fences include: galvanized, aluminized or vinyl color coated chain link fences in heights from 3’ high to 12’ high. The installation of chain-link fence involves setting posts into the ground and attaching the fence to them. The posts may be steel tubing, timber or concrete and may be driven into the ground or set in concrete. End, corner or gate posts, commonly referred to as ‘terminal posts’, must be set in concrete footing or otherwise anchored to prevent leaning under the tension of a stretched fence. Posts set between the terminal posts are called line posts and are set at intervals not to exceed 10 feet. The installer attaches the fence at one end, stretches it, and attaches at the other, easily removing the excess by “unscrewing” a wire. Reasons to Consider Residential Chain-Link Fencing? Because it is made of steel, chain-link is the strongest fence material option available and therefore the ideal choice where security is the most important consideration. We can also create a stronger chain-link fence for your property by using thicker fabric (mesh), larger top rail, adding bottom rail, or tension wire, and even installing thicker posts. Chain-link fencing is galvanized, making it highly resistant to rusting. Black and green chain-link fences are vinyl coated, adding increased strength and beauty. A chain-link fence will stand strong day after day, no matter the environmental stresses you encounter on a frequent basis. Chain-link fencing is possibly the most cost efficient material available on the market today. Even when dressed up with a color, it remains a bargain compared to other fence materials and other security solutions. When you hire All County Fence Contractors for your fencing needs you will receive the look you want with the durability you need, and we always strive to enhance our customer’s satisfaction with unequaled service. Our fencing company also offers consulting for residential and commercial clients within and surrounding area. At All County Fence Contractors our hard work goes beyond selling a quality product.